A private meeting is being held within the halls of American political power to discuss what should be done about Superman. Story - 3: We start this story with an amazing action sequence that seems to be recapping the battle of Metropolis. However something isn't quite right. The Kryptonian doesn't look like Superman and it's only ONE Kryptonian doing the destroying. However, just when you are starting to question what is going on, it's revealed that this is just a military simulation of what could happen if a Kryptonian were to attack a major city. We are in the middle of a closed door meeting from those in the upper echelon within the American political system and the United States Military. Of course, the Military doesn't trust Superman and are preparing for the worst possible scenarios of what would happen if a being of his power decided he didn't like us anymore. One of the senators, Senator Stearn, is arguing for Superman, explaining how much he has helped mankind since his arrival. Superman has been busy it seems, but as is mentioned by the General, he has so far stayed out of any conflicts between nations. �But, how long can that be expected to last? ", states the General. What is being raised in this discussion is very much what has been raised throughout Superman's history. There's no real new information being revealed. However, even though we've seen this before, and we've even discussed these points in our Superman Homepage forums, it's still engrossing. There is an undercurrent of xenophobia in the discussion as it's written in this story. You can see the influence of the real American political landscape and the fears that are being stoked by some of our politicians. I like the touches about online forums being created with people asking Superman to save them from things he can't possibly save them from. This is exactly what would happen. Heck, Kanye West would start begging him for money. I like how the Senator fighting for Superman is just as adamant about his position as the General. They are both raising excellent points with their respective positions. The Senator wants to just ask Superman and work with him. He doesn't want to go behind his back. He wants us to trust him. The General, on the other hand, believes that it's better to ask forgiveness then permission. In the end, the majority rules the day and a commission is created to investigate Superman further, WITHOUT his consent or knowledge. This is obviously the beginning of the storyline that will culminate with Superman agreeing to appear before them as shown in the trailer for "Batman v Superman: Dawn of Justice". Senator Finch's views pretty much fall in the middle at this point in the story. She seems to agree with Senator Stearn, but after the meeting is adjourned, she pulls the General aside to ask for more information. In the trailer, however, she seems much more against Superman. So, I'm thinking that what she finds out from the General, in addition to Lex Luthor's manipulation, brings her to the point that we see her in the movie. No surprise Lex Luthor panel in this issue... bummer. In summary, this is not as strong as the first two, in my opinion. However, it's still worth the read. Art - 4: What I didn't like about the cover art, thankfully does not transfer into the rest of the issue. Very solid work here once again by this team. I'm quickly becoming a fan of Sean Parsons and Joe Bennett. I hope they get to do much more work with DC. If they are already more prolific, forgive me, as I don't recognize their names. I particularly love the first quarter of this book. The action jumps off the page. The rest of the book isn't quite as good, but it's still solid overall. And, in the final panel the Superman suit does not look like the Man of Steel version, but the traditional look. Cover Art - 3: For the first time in this series I'm not in love with the cover of the book. Mostly because it's rather basic. Nothing special. 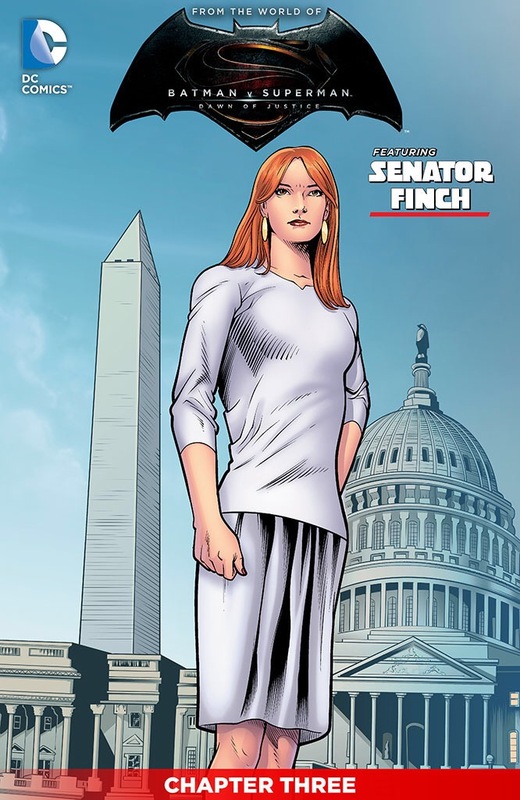 It looks good, but I would have gone with a different outfit for Senator Finch.